The Skinny: A more than worthwhile movie, whether you watch it for the slapstick cartoon violence, the mild social criticism, or both. 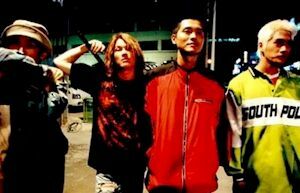 Kim Sang-jin's surprise hit from 1999, Attack the Gas Station, stars Lee Sung-Jae as No Mark, the leader of a gang of four punks who decide to rob a full-service gas station one night. They go in, steal the money, trash the place, and a night or two later decide to rob the same station again out of boredom. This time they don't find much money at all, so after rounding up the three workers and harassing the manager, they decide to keep the gas station running for the night, stow the hostages in a room and pocket all the proceeds. As the night wears on, the gang works the station (the way they treat rude customers makes this something of a cathartic movie for anyone who's ever worked retail), take several more hostages, get some Chinese food delivered, and defend their makeshift community from rival gangs and bullies with a sense of quick justice, until an inevitable ending confrontation with the police. The acting is very good from everyone here, though most of the supporting roles  the luckless station manager, the hostages, the incompetent police  are necessarily two-dimensional to give the humor something to play against. Lee Sung-Jae is particularly good as the gang's tough and efficient leader, and packs a lot of just-under-the-surface emotion into his screen time. For the gang in general, there's a lot of anger in these otherwise clueless protagonists, and in the hands of less-capable actors these characters would probably come off as being unlikable if amusing stereotypes. The direction itself is good, with a few deft camera tricks and a good objective sense of narration, but the director knows he's working with good people  there are a lot of tight shots on each of the characters to give us an idea of what they're thinking. On the one hand, Attack the Gas Station is a very accessible film to U.S. sensibilities with it's broad comedy and deceptively simple characters. There's really not much difference between this film and, say, a particularly anti-social Bill and Ted movie. On the other hand, there's a good amount of social subtext in this movie. When we first see the gang, it's hard to care about them at all  they're violent, stupid, reckless, and without any apparent likable qualities. Because of this, it's actually pretty hard to enjoy the film (especially as a comedy) in it's first twenty minutes as the viewer begins to wonder if the director actually expects them to identify with these characters. As the gang starts to turn the gas station into their own tiny fiefdom, however, we see that not only do they have a moral code but a very clear concept of what's just and what's cruel. It's a very simple (if still undeniably criminal) society they create where the corrupt are punished and the honest are rewarded or even protected. What we begin to suspect and eventually learn is that each of the gang members has a reason to act the way they do, having been bullied by authority figures or otherwise cast aside by society. The triteness of the "society is to blame" message works in the film because it's ultimately the director who's pointing this out  through some good foreshadowing and well-placed flashbacks  and not the characters. There are no Breakfast Club speeches about an unjust society or any self-justification as to why they became punks. We're never beaten over the head with any heavy statement about corrupted authority either, and it's almost as if the message is offered as a possible explanation of the gang's behavior, for us to accept or reject. The movie comes across as being honest because it never insults our intelligence despite its tidy ending.